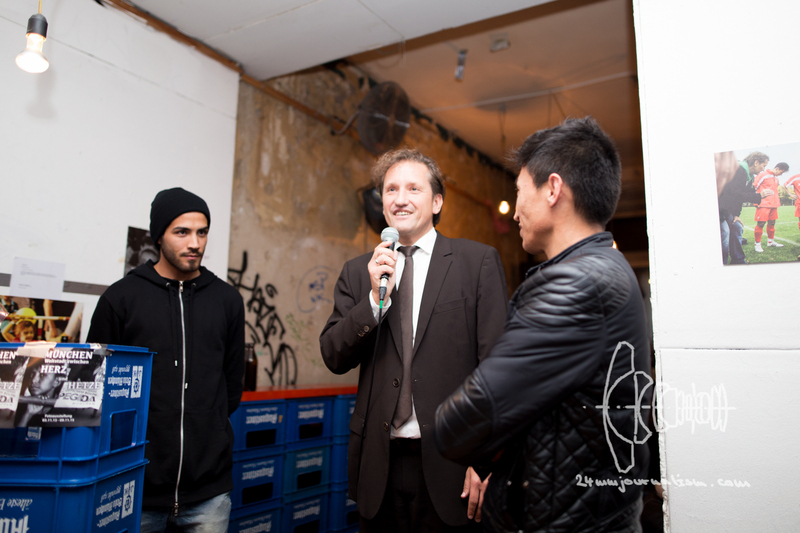 Last night colleagues and I opened our small exhibition in the artistic bar “Das Provisorium” in Munich. The pictures we are displaying (printed on alu-dibond) show the story of uprising racist movement PEGIDA in Munich – with 1500 joining the racist march in the beginning and then falling numbers up to today – and the arrival of more and more refugees at Munich central station. Munich citizens showed great courage here and stepped in – helping the new arrivers. To kick off the vernissage my colleague Leo Simon (http://lsphotography.eu/) held a speech on behalf of all photographers participating and explained what lead us to exhibiting our work. Also he thanked the Petra-Kelly-Foundation for funding us and all other supporters who helped organizing and setting up. My colleague Leo was followed by various speeches focusing on the topics: solidarity and help for refugees, far right movements in Germany and Bavaria, PEGIDA, PEGIDA Munich and newly rising racist demonstrations all over Germany by the far right party “Alternative für Deutschland” (e.g. : AfD march, Freilassing). These topics were presented by a representative of the “Junges Bündnis für Geflüchtete“, Claudia Stamm (B90/DieGrünen) & Robert Andreasch (journalist & publisher for the Munich based AIDA-Archiv). A very special role amongst the speakers and guests last night for us were two players of the ESV Neuaubing. We started accompanying their team recently and have all become big fans. The two soccer players did a little question & answer with their coach, explaining their situation and also of team-mates, that are endangered by deportation. Three of all twenty-five pictures exhibited display their team. The vernissage ended with a small party and hangout togeher, DJ J. Airforce played us some nice music. All in all – speaking for myself – I am very happy that everything worked out this well and hope some people reading this will still visit the exhibiton, which is open until next Monday. Also there will be a concert in solidarity with refugees next Monday in the bar. ESV Neuaubing player talking to the audience about life in Aphganistan. Player of ESV Neuaubing posing in front of printed pictures of the team. ESV Neuaubing player talking to the audience about the high danger of deportation that some team members are facing..
Robert Andreasch talking about PEGIDA and far right movements. Claudia Stamm (B90/DieGrünen) speaking to audience. Representative of the “Junges Bündnis für Geflüchtete” explaining how help and solidarity with refugees can be organized.